ISACA Toronto Chapter and its associates (such as ISACA International) respect your privacy and work hard to safeguard the privacy of your personal data. We realize that the exciting growth of the Internet and online services raise questions concerning the nature, use and confidentiality of information collected about consumers. We want you to know that we apply our long-standing commitment to safeguarding privacy to our online and Internet activities. ISACA Toronto Chapter does not share, disclose or sell any personally identifiable information (such as your name, address, telephone number or email address). Any future forms process on our web site may include the IP address of the sender in the sent form. This information is not stored on our site. No personal information is stored on the web site, nor on databases connected to the site. In the future, should ISACA Toronto Chapter decide to share any data with third parties for marketing, it will provide notification and the opportunity for its users to indicate whether they would prefer that the Company or member email address are not provided to third parties. ISACA Toronto Chapter also does not market to, or knowingly collect personal information. ISACA Toronto Chapter is not using cookies on the web site. Cookies are small text files a web site can place on a user's computer which are used to recognize repeat user's and facilitate the user's ongoing access to and use of the site. Non-personal identification information might include the browser used by the user, the type of computer, the operating systems, Internet service providers and other similar information. We use a server hosted by a third party who may log your IP addresses for security purposes. 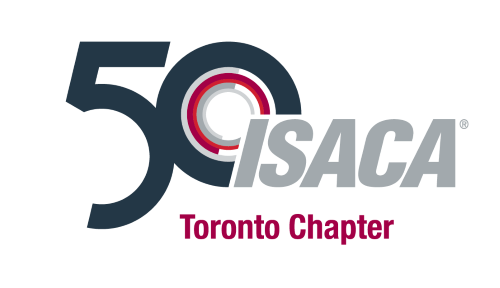 ISACA Toronto Chapter may use email addresses you provide us to send you emails related to ISACA Toronto Chapter events, services and information or if you have affirmatively indicated a desire to receive additional information. If at any time, you would prefer not to receive further marketing communications, please send an email to the Director of Membership and/or the Webmaster. If we cancel a program event (course, workshop, training session, etc) for any reason, our liability is limited to the registration fee only. The speakers, topics and events are correct at the time of publishing and if unforeseen circumstances occur, ISACA Toronto Chapter reserves the right to alter or delete items from the program. The presenters have prepared this material for the professional development of ISACA members and others. Although they trust that it will be useful for this purpose, neither the presenters nor ISACA Toronto Chapter can warrant that the use of this material would be adequate to discharge the legal or professional liability of members in the conduct of their practices.